By default, when a sequence is saved in the Sequence Editor, the Sequence Editor will also save a compressed version of the sequence. Compressed sequences are intended for use during shows, as they can be loaded much faster than their associated sequences, yet contain all information necessary to play the sequence. For many customers, this default behavior of automatically saving a compressed sequence every time the sequence itself is saved is fine. However, for large sequences, saving the compressed sequence could take a noticeable amount of time. Therefore, the user has the option to disable automatic compression. Even if this behavior is disabled, though, it would still behoove the user to make sure that up-to-date compressed sequences exist before running their show. The Sequence Compressor program can be used to do this. It can be used to compress all sequences in the entire schedule, or all sequences in a specified show, or a single specified sequence. Simply choose which of those you want to do (and, if appropriate, choose the show or sequence), and click the "Compress" button. The "Output Log" tab will show what the Sequence Compressor is doing, as it does it. When the Sequence Compressor finishes, it will open a message box saying so, and the "Results" tab will contain a summary of what has been done. The summary will say, for example, how many (and which) sequences were compressed, and give details about any errors or warnings that happened. If desired, the "Save" button can be used to save both the results summary and the output log to a file. 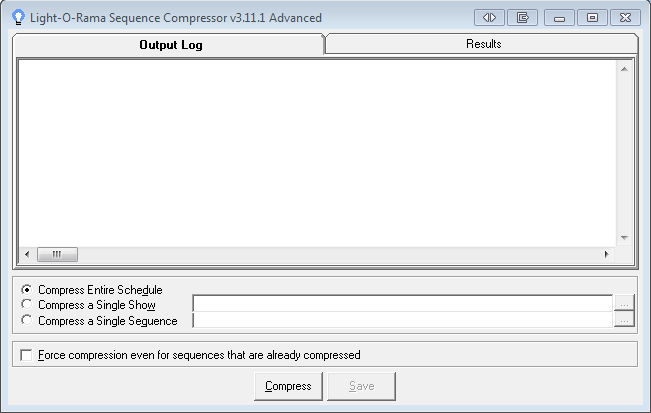 If some particular sequence already has an up-to-date compressed sequence available, the Sequence Compressor will simply skip that sequence, unless the "Force compression even for sequences that are already compressed" box is checked. Please note that not all sequences can be compressed. In particular, any sequence that contains a loop cannot be compressed, nor can any sequence that contains two or more tracks with different time lengths. If such a sequence is encountered, the Sequence Compressor will issue a "warning" (not an "error") about it. This is because it's perfectly valid to make a sequence that (for example) contains two or more tracks with different time lengths, and if that's what you want to do, then that's fine, so it's not an "error". But having two or more tracks of different lengths might be unintentional, and so the Sequence Compressor will "warn" about it, just so that you are aware of it, and can easily double check whether it is really what you want.